Aurora Keyes Barn School is a special needs day school in Lancashire providing specialist education for boys with Social, Emotional and Mental Health difficulties (SEMH). Aurora Keyes Barn School is an independent day school in Lancashire providing specialist education for boys with Social, Emotional and Mental Health difficulties (SEMH). Welcome to Aurora Keyes Barn School. Our vision for the school has remained steadfast since we opened in April 2008. Our goal is to give every child who attends Aurora Keyes Barn School hop, a positive future and a chance to discover their full potential. We are renowned for our calm environment and as a place where pupils enjoy engaging in a broad and balanced curriculum. Whatever issues pupils face, our dedicated team work tirelessly to help them work on their behavior, build their confidence and realise their individual potential. I'm tremendously proud of the team and the work we do here at Aurora Keyes Barn School. Hopefully the following information gives you a sense of what school life is like. To get a real feel for the atmosphere and environment we have created, please don't hesitate to contact me to organise a visit and I'd be happy to meet with you and your family for a tour. Special Needs: Moderate Learning Difficulties (MLD), Autistic Spectrum Disorder (ASD), Dyspraxia, Dyslexia, Dyscalculia & Dysgraphia, Oppositional Defiance Disorder (ODD), Obsessive Compulsive Disorder (OCD), Tourette syndrome and Attention Deficit Hyperactivitiy Disorder (ADHD). High levels of support: All pupils are provided with enhanced support throughout the school day. This will enable pupils to access the curriculum and participate in school activities. Flexible placements: Education is delivered for 38 weeks of the year. Pupils are admitted throughout the year. We offer an inclusion policy allowing for mainstream support where requested and the provision of “time-out placement” for periods of time within each week. Preparing pupils for life beyond school – developing their abilities and achieving their own unique level of independence as they approach adolescence. The school is situated in Salwick near Preston in a converted barn. Salwick is a largely rural village between Kirkham and Preston in Lancashire. The main part of the school is based in a converted barn, with two additional classrooms, a multipurpose room and break out areas positioned alongside it which can cater for up to 20 pupils. The two classrooms are kitted out with an ICT suite, which pupils make use of in a number of lessons and during their break times. 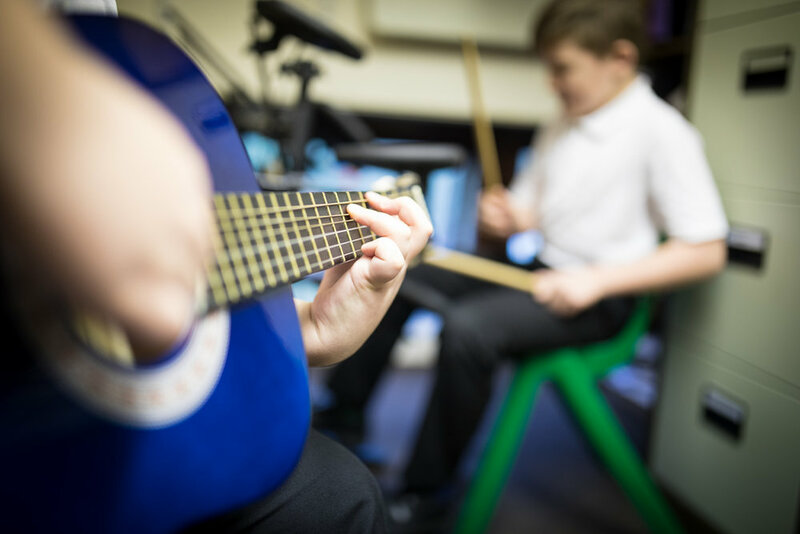 Within our breakout areas we have a music space, with guitars and an electronic drum set which pupils are open to use. We have a number of outdoor areas. Our soft area has a climbing frame and trampoline which pupils can use during the summer. For the winter months we have a hard court area around the school where some pupils ride their scooters or play ball games. We’ve also got a horticultural area, where pupils get involved in maintaining and growing vegetables and plants. In addition to the facilities on site, the pupils are provided with access to a range of Sports and Outdoor Education centres within the local area. The school day is 9.05am to 2.45pm Monday to Thursday; 2.30pm finish on Fridays. Children are collected from home by their school staff and dropped back home at the end of the day. We find this supports higher levels of attendance, effective safeguarding, strong relationships and allows pupils regular access to a non-teaching member of staff if they need to talk to someone. It also allows for parents or carers to have daily contact with the school staff. All pupils have access to a broad, balanced and differentiated National Curriculum. Class sizes are small, enabling pupils to receive a more focused and personalised education, which also allows for individual targets to be monitored more closely. Programmes of personalised delivery are then laid out. To encourage the development of pupil's confidence, personal as well as academic skills are nurtured. The school assembly offers pupils the opportunity to celebrate achievements, events and special occasions together. It will often have a spiritual or moral focus, whilst on other occasions a class will share their work with the rest of the school. On Monday’s assembly, we share and celebrate pupils’ achievements over the last school week. Friday’s assembly is prize assembly where we celebrate and reward pupils for their efforts. As part of the curriculum, Keyes Barn is committed to promoting Physical Education and encouraging pupils to enjoy many elements of physical activity. Each class has two P.E. sessions a week which incorporates individual activity, team games, swimming and more adventurous activities i.e. use of the climbing wall at West View Leisure Centre. All kit required for all activities is provided and laundered by school. Pupils are required to wear their own trainers. All children attending school are expected to take part in all physical activities unless there us a suitable medical explanation. Our pupils cover the full range of ability. Many may have significant learning difficulties as a result of their emotional and behavioural problems, and are less likely to become spontaneously involved in learning activities. Their attitudes towards and capacities for learning will vary considerably. We therefore place great emphasis on differentiation of activities and materials to take account of individual learning styles. We take a proactive approach to identify all potential problems and avoid their escalation through addressing issues physically, emotionally and socially. The individual needs and difficulties of each pupil can be met through a variation of class-based, group and individual strategies involving a wide range of teaching skills, perspectives and resources. The school operates a simple behaviour identification system where children are assessed by staff (alongside some self-monitoring) and, through negotiation, rewarded for improvement and achievements. To identify the more specific behavioural issues, each child will have an objectively created profile based on ‘base line observations’ by all staff. From this, target areas will be identified within a development meeting (comprised of teachers, keyworkers and senior members of staff) and time limited attempts will be made to change behaviour i.e. increase/reduce, develop/eliminate negative behaviours and reinforce positive behaviours. We offer a diverse range of services to enable each child to benefit from targeted support, relevant interventions and experiences within and outside formal education. A highly profiled system of educational and behavioural objectives. Each child to work hard to improve his behaviour and standard of work. All members of the school community to treat each other with respect and to consider others at all times. Each pupil to walk around school sensibly ensuring safety. Each pupil to use appropriate language at all times. That all pupils should present themselves in a clean and tidy manner supported from home. That pupils sit sensibly in minibuses and follow the ‘Safety in Vehicle’ Code. That pupils eat correctly and use good table manners at lunchtimes. That pupils positively represent the school on outside visits and behave in a socially acceptable way. The school is easily accessible from the M6, M55 and the M65. From the M6 take junction 32, take At Broughton Roundabout, take the 1st exit onto Garstang Rd/A6 410 ft, turn left onto Eastway/B6241 0.2 miles, at the roundabout, take the 1st exit and stay on Eastway/B6241 0.3 miles. At the roundabout, take the 2nd exit and stay on Eastway/B6241. Continue to follow B6241 for 1.5 miles. At the roundabout, take the 4th exit onto Tag Ln/B5411 for 0.2 miles. Turn left onto Hoyles Ln for 1.3 miles. Turn right onto Sidgreaves Ln for 0.3 miles. Turn left onto Lea Ln for 1.2 miles. Turn right onto Deepdale Ln for 0.7 miles. Turn right onto Station Rd.